My sister is a doctorate student abroad. Her studies have already brought her around the world for free as an academic scholar and her performance so far has been nothing short of stellar. When new foreign acquaintances learn of her academic achievements and that she is a Filipina, they express such tremendous astonishment to the point of almost being inadvertently insulting. There is hardly any doubt that my sister’s foreign friends think in much the same way as a lot of other foreign personalities, stars and tourists who are asked the embarrassingly undying question, “What do you think of Filipinas?” As most of us never tire of hearing, a lot of people seem to think Filipinas are lovely, caring, loving and nothing else. It is as if there is a great void that excludes intelligence, wisdom, strength and talent. It is as if the adjectives that people use to describe the Filipina collective identity fit only the stereotypical roles of the Filipina as a caregiver, domestic helper and mail order bride. What a lot of people do not know is that the Philippines is not a factory for ideal women who care for older men in their retirement. This country, like any other country in the world is also the home of women of achievement and distinction. In the American music and film industry alone, a handful of talented women with Filipina blood have rubbed elbows with foreign stars. Perhaps some do not know that, regardless of whether they recognize their biological heritage or not, Tia Carrera, Nicole Scherzinger, Vanessa Minillo and Vanessa Hudgens all draw part of their talent from their Filipino bloodlines. But the smattering of Filipina-Americans in Hollywood is just the tip of the iceberg. More than just entertainers, singers and dancers, there are also Filipinas who are award winning international performers like Lea Salonga and Cecil Licad. Salonga has performed major roles in Miss Saigon and Les Miserables in Broadway and has been awarded a Tony and an Olivier, besting other senior performers. Licad is a premier international pianist who has performed intricate Rachmaninoff pieces in Carnegie Hall. She has played with the London Philharmonic, the New York Philharmonic and the Chicago Symphony among others and has become the youngest female to be given the Leventritt Gold Medal. Outside of the performing arts, our country also boasts of being the place of origin of Filipina visual artists Pacita Abad and Virginia Cruz Santos. Abad has conquered the world with 3,500 trapunto paintings of sewn fabric in 70 countries and has had a total of 40 exhibits mounted in the different continents and cities of the world including Paris, New York and Washington D.C. Santos on the other hand is a mistress in contemporary art. Some may not have known it but Santos was the creative hand behind Dory of Finding Nemo, Cow Girl of Toy Story 2, and Helen Parr and Dash of the Incredibles. More than just artists, Filipinas are also artist entrepreneurs and you only need to look up the names of Monique Lhuillier and Josie Natori to appreciate that. Lhuillier specializes in bridal gowns but has designed other formal pieces for the elite women of Hollywood and is now a member of the Council of Fashion Designers of America. Natori is the founder and CEO of the Natori Company, a top luxury brand of women’s clothes and lingerie sold in Macy’s, Bloomingdale’s and Nordstrom. Art and business are not the only areas of excellence for Filipinas and we have Josette Biyo to prove that. Competing against 4,000 teachers around the globe, Biyo won the 2002 Intel Science and Engineering fair in Louisville, Kentucky and became the first Asian to win the Intel Excellence in Teaching Award. Today, there is a Filipina name etched among the stars as minor planet 13241 is now named Planet Biyo. If the question is about the contribution of the Filipina to the world, then we can proudly say that we have Corazon Aquino, the renowned champion of freedom, human rights and democracy. Aquino was Asia’s first female president and has been distinguished as Time’s Woman of the Year for 1986 and one of Time’s Asian heroes for 2006. The list can go on indefinitely but the point should have already been clearly made. The Filipina is not something you can define in a dictionary or a travel guide. The Filipina is someone who has a right to define her own identity without the assistance of people who think they know and understand. The Filipina is someone who has as much a right to be a citizen of the world as anyone else. *For more of the many faces of the Filipina you can go to the Filipina Writing Project. This writing project is sponsored by Barangay.ph, Kababayan.ph, MyUSMailbox.com and RegaloService.com. Cecile Licad is no longer married to Antonio Meneses so please stop amending her name with "Meneses". Also, as far as I know, she has never referred to herself as "Cecile Licad-Meneses" even while she was married. She is simply, "Cecile Licad." Hello GraceMags. Thank you for your entry. Please make the writing project link clickable (where people will end up to our writing project site once clicked). Hello GraceMags. Thank you for making the project link clickable. Please expect to be included in the week 1 summary tomorrow. Hello GraceMags. 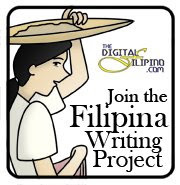 I would like to invite you to e-mail me an audio version of your entry so I can include it in our Filipina Writing Project podcast. Thank you. Very informative write-up. I have the same feeling even now while pursuing my PhD Engineering abroad (UK)that foreigners think that Filipinos can not achieve this level of education. I did all my postgrad programs abroad and I was lucky enough to get scholarships by my own effort. Having this opportunity, I can travel around as well. Good luck! Philippinos are no differant than any other people in this world. The only thing they lack are opportunity and funds. The Philippinos are industrious and intelligent. As far as countries in this world, the Philippinos love America and Americans as much as anyone maybe more. I have been to the Caribean and Hawaii but if I had been to the Philippines before I would have always returned. This country is not convinient to travel to for Americans, this is why we do not have the knowledge and understanding of its peoples and culture. My recent travels to the Philippines have change my life, in a positive way. The rest of my life is dedicated to my friends and family in the Philippine Islands. Having read your post and given the opportunity to learn of the tremendous talents that is represented by Filipinas, I am still wondering why the rest of the world still have such negative stereotypes the filipino peole. Would it help if the political leaders of your nation was not so corrupt. Maybe the image of the Filipinas will not be so tarnished if the country does not need to depend on mail ordered brides for White old men from the west. Maybe then the world image of the Filipinas will be more positive.